The wine of many years' standing made in Jiujiang is clear and looks amber in color. It tastes pure and mild. The cakes and candies made in Jiujiang are crispy and fragrant. Ganzhou is famous for arts and crafts, such as leather cases and bags, and pillows. The pressed salted duck is a local flavor from Nan'an. Other local products from Ganzhou include watermelon seeds, phytin, Malan melon, and shaddock. The Cloud-and-Fog tea from Mt. Lushan was a tribute to the royal court in the Song Dynasty. It is green, and tastes pure and sweet, growing in valleys amidst cloud and fog all year round, hence the name. The stonefish, umbilicaria, and rock partridge are the famous dishes in Mt. Lushan. Found between stones, the stonefish is as small as needle, and has exceptional delicacies. Also growing between stones, it is as small as needle, and tastes delicious. Dark brown in color, it can be found in mountain streams, and tastes tender. Blue and White Porcelain is one of the four famous traditional porcelain wares in Jingdezhen. Painted in blue and white and then baked in high heat, the color will never fade. 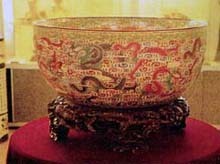 Exquisite Porcelain was developed on the basis of the hollow craftsmanship popular in the Song Dynasty. The base is first carved into hollow, which will be glazed in color, and then baked. Patterns are first drawn on the white porcelain ware and then painted in color. After baking, the color is mild and fine. It is thin, exquisite, elegant, and precious. Beautifully shaped with high techniques, all topics are available for such design. The most representative works are Guanyin, arhat, dragon boat, and characters from Journey to the West, and Outlaw of the Marsh.